If you have someone on your holiday gift list that is difficult to buy for either because they have everything or want nothing, chocolate and candy are the perfect go-to gift ideas! As I sit here and think about it - I don't know a single person that wouldn't love getting one or the other - or even both! The holidays are all about family memories and traditions. During Christmas vacation my two kids and I make several trips to the mall to enjoy the holiday samples, decorations, sales and of course, SANTA! One seasonal store at the mall that my children and I are always most excited about is See's Candy! See's Candies offers a variety of free samples and my children absolutely love their lollypops! They always have a difficult time choosing a flavor, but remember that on our next visit they can choose a different one! Chocolate and butterscotch seem to be their favorites! 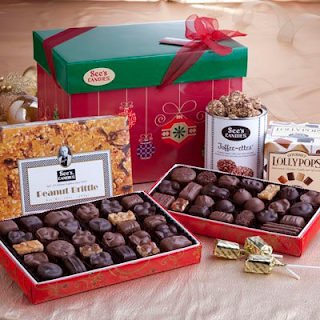 See's Candy has a great selection of boxed chocolates, truffles and nuts perfect for holiday gift giving! My family has had the pleasure of sampling several of their products and they are all delicious! See's Candies was founded in 1921 and currently offers more than 100 varieties of delicious, mouth-watering candies! They also offer sugar free and Kosher options. This giveaway will end November 14th at Midnight EST. Disclaimer: The Being Frugal and Making it Work family received a complimentary See's Candies candy assortment for the purpose of writing a review and hosting a giveaway. Regardless, I only recommend products or services I would use personally and/or believe will be a good fit for my readers. The views and opinions expressed on this blog are based purely by our own experiences. No monetary compensation was received. Results may vary. The GOLD FANCY box or perhaps the Dark Nuts and Chews box. Really it would be pretty difficult to choose just one!! I think one of the first things I would want is the California brittle. The favorite treat is something that my husband and I make are brownies with a mint cream frosting then coated in chocolate. So many goodies for one store! I would use my gift card to buy some of the Marshmallow Jack-O-Lantern's and some chocolate covered peanuts of course! See's Candies look delicious! I think I would like to try the Pumpkin Pie Truffles. They'd be great for Thanksgiving. Thanks for the review and giveaway! I would purchase 2 lb. Assorted Chocolates with my gift card. I would use the gift card to purchase the Sweet & Spooky Gift Box! Nice! I like pumpkin pies for fall, candy corn for Halloween. My favorite holiday treat is my mother's cranberry pecan pie. It is truly delicious! Her fudge is a close second too! I would purchase the Trick-or-Treat Box for my son. I think I would also purchase the Petite Boo Box. Cute! I would love t purchase a box of truffles or the Signature Gift pack that has a bunch of different flavors! I would definitely have to purchase some milk chocolate Nuts and Chews. All of their candy looks really delicious. I would either purchase the Pecan Buds or an assortment consisting of assorted candy bars, a small lollypop box, and the 8 oz. box of truffles to give to my mom. A few of my favorite holiday desserts would have to be pecan pie, fudge, and almond roca. I would get the Milk Chocolate Soft Centers. I would get a box of molasses chips and an assortment of other chocolates. My favorite holiday desserts are homemade fudge and caramel. I'd love to get a box of Nuts and Chews! They're my family favorite. I'd love to get a box of Nuts and Chews! They're my family favorite. I always pick out the scotchmallows and the caramels while hubby grabs anything in dark chocolate! My favorite See's Candies chocolates are the milk chocolate buttercreams. They are soft and the chocolate is so creamy! My favorite Holiday treat is Pecan Pie! I love the filling with the nuts on top and it is so yummy and gooey. I can not wait to have a piece! Oh man it's hard to choose just one thing! I LOOOOVE their chocolate covered cherries though!! I would choose a 1 pound custom box and I would add dark cocoanut, peanut butter patties and some milk butterchews. They have such a huge variety and they all look really good. Thank you. My favorite holiday dessert is definitely my moms red velvet cake. She has made it every year of my life and the holidays just wouldn't be the same without it. Thank you. I'd totally make a custom box! It would be full of raspberry and strawberry cream! It may sound strange, but my fave holiday treat is fruit cake! Minus the nuts of course. I also love to make chocolate covered pretzels! My favorite holiday treat is homemade Christmas cookies. So many choices! I think I would get some of the dark peppermints. They look delicious. My favorite holiday treat is home made chocolate fudge. My favorite holiday treats are egg nog, ribbon candy and really anything made of chocolate!!! I would purchase the Pumpkin Pie Truffles because they would be perfect to serve at Thanksgiving and the Scotchmallows because they're my favorite. It would be a hard decision but I'd probably end up getting a box of the Pecan Buds. My favorite holiday treat is fudge or pecan turtles. I also love Russian Tea Cookies. I would probably get a box with some dark cherries for myself and then fill the rest with milk Bordeaux for my son. My favorite holiday treat are homemade persimmon cookies. I have the best recipe. Too bad persimmons aren't available year round. i would get a couple of pumpkin truffles, one for my sister and one for me! my favorite treat is divinty. unfortunately i am no good at making it myself so i only get it at Christmas when a friend makes it for me. but i guess thats what makes it special! I would get a box of nuts and chews.Thanks for the chance. I would purchase the sugar free peanut brittle. My husband is a diabetic and I have to buy sugar free candies for him. I would buy the peanut butter patties - yum! I would choose Milk Chocolate Nuts and Chews. See's Candy is one of my favorite chocolates. If I won, I would get the Autumn Treasures. I like the variety of chocolates it offers. My favorite Holiday Treat or Dessert is Pumpkin Pie with Whipped Cream on top. However, I would want it to be homemade by my Mom... store bought Pumpkin Pie is just not the same nor as good. I would love to get the Chocolate and Variety box. See's ha so many great flavors, and I want to enjoy and share a bunch of them! I would buy: molasses chips, California Crunch, Cashew Brittle, Bordeaux, Normandie, Beverly, Mocha, Butterscotch Chews, and Vanilla Nut Caramels! See's is my favorite--Thanks for the giveaway! You really expect me to pick? I went to a grand opening at a nearby See's last year and could eat everything. I'd probably go directly to the store and create my own box of yum. I love chocolate! Chocolate covered nuts are in my top 5 favorite things to eat, but if I had to choose one thing from See's, it would be the California Brittle. My favorite treat to make at the holidays is a Cranberry, White Chocolate & Pecan Tart. I was first introduced to See's when they opened their store in Beachwood. My favorites are the peanut brittle and California brittle. I would enjoy a custom mix box with divinity puff, key lime truffle, milk butterchew, caramel, light chocolate truffle, milk almond, pecan bud, almond square, butterscotch square, milk chocolate butter, and milk buttercream. Oh glory! I would order Chocolate Walnut Fudge! I looooove fudge! I've never tried See's fudge, but I'm sure it's as amazing as their other candies. Yum! I would purchase a custom mix box with raspberry truffles and raspberry cream chocolates. Love See's chocolates! My favorite that I would choose is the nuts & chews. The peanut brittle is another yummy one! I love the chocolate lolipops. They are soo good and not just for kids, it's like an adult lolipop. My husband is diabetic and has to limit his sugar intake. I would use the GC to get him the Sugar Free Peanut Brittle. One of my favorite holiday treats is home-made Chex mix. When I was younger, my mom would make it and I can still taste the garlic and butter richness. I'd get all my favorites...English Walnut Squares, Rum Nougat, Vanilla Nut Creams and Polar Bear Paws. ....might try making the apple butter version soon. I love Buckeyes! My family has made them for generations, and it look forward to them all year. Visited the site and I would really like to try Thanksgiving Chocolate Creams because they look simply delicious! My favorite holiday treat is rich Christmas cake, I just wish my whole family enjoyed it. I would definitely purchase the Milk Chocolate with Toffee Nuggets Candy Bar to try and then I would have to get one of my favorite Walnut Square bars! Yum! The candy from Sees is so incredibly delicious! Thanks! My favorite holiday treat is a cheesecake coffee cake that my mom makes for me every year! It's one of my favorite desserts and I could eat it all day every day :) Thanks! My favorite holiday treat is pumpkin pie. Homemade from my sister or mom or from Costco. Ohhhh... the Milk Chocolate Turkeys are super adorable! My favorite treat is mashed potatoes and gravy. LOTS of them! Haha. My post was just 12 words. Reading comprehension is apparently not my strong suit. My favorite holiday treat is mashed potatoes and gravy. Cooked by my mom and in LARGE quantities. Oh my gosh I had I hard time trying to narrow my selection down. I would choose the Seasonal Pie Truffles. My favorite treat is a cherry dream pie made with Phildadelphia cream cheese, cherries, sweetened condensed milk, etc. Peppermint filling with powdered sugar. Plain chocolate filling with raspberry. I would love to get the Christmas Gold Wreath Box. I would love to share it with my family. I would have to buy some stocking stuffers for sure! The Cinnamon Lollypops, peanut butter treat,sour starts, oh my I want it all! my favorite store bought treat during the holidays is those Orange shaped and flavored chocolates, the ones you whack on the counter then eat the slices, I forget who makes them! My favorite candy at Sees is a caramel sucker, but I would love to buy a box of Nuts and Chews for my mom. I'd buy california brittle, I love brittle so much it's my absolute favorite! Their Dark Nuts & Chews are amazing, I always pick up a box when I go to the mall. Yum! My very favorite See's Candy is their Nuts & Chews. The goodies in that box are the best of the best! My favorite holiday goody is See's Candy Nuts & Chews box! We order it every year at Christmas! my favorite holiday treat is a big batch of ginger bread cookies or a pumpkin and chocolate cheesecake. My favorite holiday desserts are homemade chocolate and peanut butter fudge, candy canes, and peanut brittle! If I won the gift card I would like to try the Pumpkin Pie Truffles, they sound yummy! If I won I would get the lollipops. I pick them up at airports when I travel and love them. My favorite Christmas treat are homemade peanut butter buckeyes. It is a family tradition to make them around the holidays. Mm, the Chocolate Walnut Fudge stands out for me. Great ideas for some Christmas gifts too tho, my mom would love the dark chocolate truffles. She always stops to get something from See's when she's traveling since they have stations at the airport here. I would get the Dark Nuts & Chews box with a traditional dark chocolate assortment packed with top-quality peanuts, California-grown English walnuts, almonds, chewy Caramel and, my favorite, the honey Scotchmallows all covered in dark chocolate. I would purchase peanut brittle and some assorted chocolates. 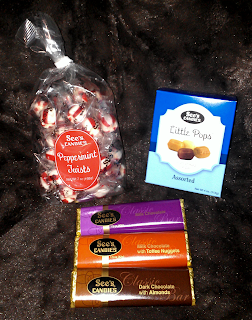 I love Sees Candies - they having amazingly delicious products! I would probably create a custom mix box with dark chocolate butter, milk buttercream, butterscotch square, almond square, and dark bordeaux. I would love the Holiday Fancy giftbox. The holy pattern on the box would be perfect to have on the coffee table! I don't even have to look :), my favorites are bordeaux and butterscotch squares. I miss living on the west coast!!! I would get Milk Buttercreams. My favorite holiday treats are homemade cookies, especially chocolate chip cookies. I also love treat called reindeer food. I love their selection because it's very reasonably priced but I would love to try Chocolate Walnut Fudge. If I won, i would get the Assorted Pecan Buddies and the Victoria Toffee. they both look really good! I'm not sure they all sound so good I was really thinking the Peanut Butter Patties but I would probably end up choosing the Create Custom Mix Box. I love a bunch of different holiday treats like all the Christmas cookies but my favorite is an apple pie. I would get the Toffee-ette®, they look really good! Everything i hear about see's is always positive! I love all kinds of treats around Christmas time! My favorite thing to make and eat is some peanutbutter kiss cookies! I would buy the Peanut Butter Treat, the Milk Chocolate Foil Balls and the Polar Bear Box to use for stocking stuffers! I like the Dark Pecan Buds. My favorite holiday treat, because we only have it once a year, is homemade Amaretto Chocolate Cheesecake. My grandmother made rum balls for Christmas when I was growing up, they were so good! She once sent a very strong batch to my drama teacher in high school, he loved them. I miss her so much this time of year! I would buy the Bordeaux™ Pecan Fudge. My mom would always make fudge around the holidays, and this candy just always brings that back. But there are also so many other candies that look amazing!! My favorite holiday treat is fudge. My mom went all out for holidays and I always remember this time of year fondly with memories of warmth and happiness and excitement. She would make so many things but the one steady candy was fudge and she only made it once a year. Oh my goodness, so many tasty treats! The assorted peacan buddies would definitely be purchased! I would choose the Assorted Pecan Buddies. I absolutely love pecans and chocolate together, delicious!!! I can't resist these. I would get the walnut fudge. I have had before and it is delicious. I might have to hide it from the rest of the family though. One of my favorite holdiday treats are pumpkin goo-ies that my wife and mother in law make. It is like pumpkin and cheesecake together. Really good. I would love to try the Chocolate Walnut Fudge, Assorted Pecan Buddies and the Maple Cashew and Peanut Brittle Pack, all sound so yummy!! The toffee-ettes are my favorite but I also love truffles and their lollypops. I really love homemade cookies and my neighbor growing up would make the best homemade fudge!